The Google Android mobile device operating system reached a new milestone during the third quarter of 2013 (3Q13), according to the latest global market study by International Data Corporation (IDC). With a total base of 211.6 million smartphone units shipped during the quarter, Android accounted for 81.0 percent of all smartphone shipments -- marking the first time that Android topped 80 percent in its short history. Despite high saturation rates in a number of key mature markets, the overall smartphone space grew 39.9 percent year-over-year in the third quarter of 2013. Also reaching a milestone was Microsoft's Windows Phone, which grew by 156.0 percent year over year. Granted, volumes started from a small base of 3.7 million units a year ago and overall market share is still less than five percent. But Microsoft's efforts, with Nokia's support behind it, helped drive the platform into multiple tiers and price points. "Android and Windows Phone continued to make significant strides in the third quarter. Despite their differences in market share, they both have one important factor behind their success: price," said Ramon Llamas, research manager at IDC. "Both platforms have a selection of devices available at prices low enough to be affordable to the mass market, and it is the mass market that is driving the entire market forward." Smartphone average selling prices (ASPs) have continued to decline as the appetite for more affordable devices grows. ASPs were down -12.5 percent in 3Q13, accounting for an average price of $317. At the same time, the market has seen a large influx of large-screen smartphones (5-7” screens), also known as phablets. Large-screen devices generally come with a higher selling price than smaller screen devices, due to the need for more powerful and expensive components. Phablet ASPs in 3Q13 were notably higher than the market average at $443. 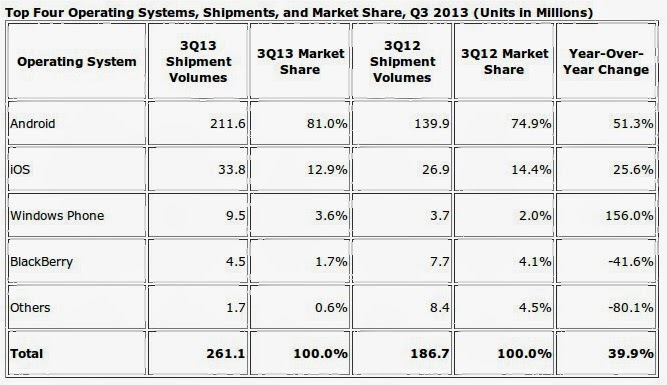 However, the 3Q13 ASP was down -22.8 percent from the $573 phablet ASP in 3Q12. Almost all successful Android vendors have added one or more 5-7-inch phablets to their product portfolios. And Nokia’s recent announcement of the Lumia 1320 and 1520 put them in the category as well. 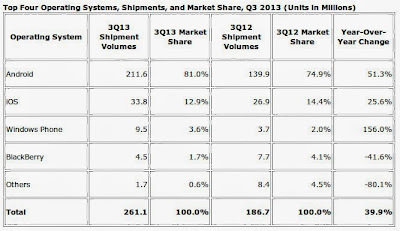 In 3Q13, phablet shipments accounted for 21 percent of the smartphone market, up from just 3 percent a year ago. IDC believes that the absence of a large-screen device may have contributed to Apple's inability to grow share in the third quarter.